Modelling autocorrelation structure among space–time observations is crucial in space–time modelling and forecasting. 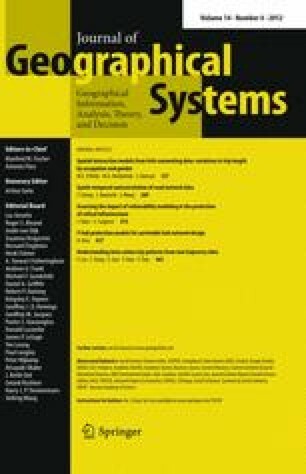 The aim of this research is to examine the spatio-temporal autocorrelation structure of road networks in order to determine likely requirements for building a suitable space–time forecasting model. Exploratory space–time autocorrelation analysis is carried out using journey time data collected on London’s road network. Through the use of both global and local autocorrelation measures, the autocorrelation structure of the road network is found to be dynamic and heterogeneous in both space and time. It reveals that a global measure of autocorrelation is not sufficient to explain the network structure. Dynamic and local structures must be accounted for space–time modelling and forecasting. This has broad implications for space–time modelling and network complexity. The authors would like to thank Transport for London for providing the journey time data. This research is carried out under the STANDARD project, which is sponsored by the UK Engineering and Physical Sciences Research Council under Research Grant EP/G023212/1. The support from Chinese NSF (40830530) is acknowledged. The authors are grateful to three anonymous reviewers and the editor for their valuable suggestions.